You are here: Home / Crochet / Pokemon Crochet Patterns You Need To Make! Since the recent launch of Pokémon Go, the popular augmented reality app, the Internet has been abuzz with how to catch them all. While browsing my Pinterest newsfeed, I began to notice crochet patterns popping up all over the place with Pokémon inspiration. From poké ball patterns, to amigurumi, players are literally weaving together their love of the game with their artistic talents to produce some really cool items. This is one of the things that I love about crochet, the opportunities are limitless when It comes up to hand-crafting gifts, décor, and accessories to express hobbies and interests. Check out our own poké ball coasters. After all, you need something to set your cold drinks on while you walk around playing the game, right? This poké bag created by Athena Handmade is awesome! This was created to hold the items used during the original Pokémon trading card game. Hooking Rainbows has created a unique poké ball scarf that is both fun and functional. I can’t wait to make and wear this when it gets cool out. Looking for a new Nintendo DS cover? 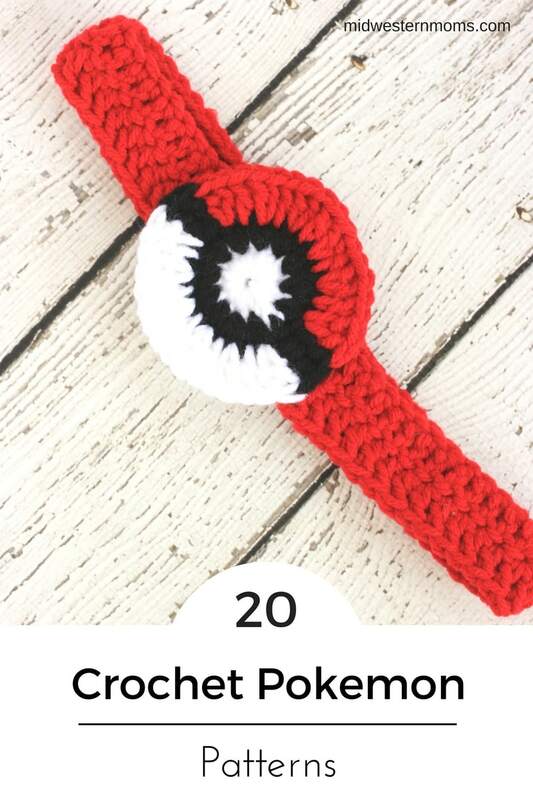 i Crochet Things has a DS poké ball cover pattern, which I’m pretty sure would also be great used as a coin purse, or even adapted into a cell phone case. It just wouldn’t be right if I started with any character besides Pikachu. This free amigurumi Pikachu pattern created by 53 Stitches is adorable. This Charmander amigurumi crochet pattern from AmigurumiPianosound has the cutest tail ever. Be sure to check out the end of their post also, as they also have patterns for Squirtle and Balbasaur! Eevee and the evolutions of this character are one of the more interesting aspects of the game. Wolf Dreamer OTH has a really sweet Eevee plush pattern for free. Check out this Baby Vaporeon pattern from Deviant Art user aphid777. While you are there, make sure to browse the additional evolution patterns available. Crochetnanigans has created a Magikarp crochet pattern. This is the Pokémon that we refer to as the floppy fish at home. But seriously, where are all of the Pidgey patterns? I seem to have an excess of them in my game storage, but no patterns to be found! This Pokémon headband can help the ladies keep their hair back during series times of battle. It also makes a cute accessory for the Pokémon lover in your life. Ravelry has a ton of great Pokémon patterns. Here’s a free Pikachu crochet hat pattern download made by Ziata Tomikj. Babies can sport poké -gear too. This Pokemon baby hat from Hopeful Honey is so cute! I’m nearly giddy over this Bulbasaur crochet hat by Toqua’s Crafts. One of my favorite characters. They also have a Charmander hat that is very cute as well on this site. Another Ravelry find by user, K Guz. This Jigglypuff inspired beanie pattern will add a touch of cute but fierce to your Pokémon adventures. I couldn’t leave out these Bulbasaur baby booties that I found on the site, Mia’s Atelier. Perfect starter Pokémon for the little ones. Check out the free Pokeblanet pattern by Ravelry user Trish Rice. This would be great for those days you just want to snuggle up on the couch, drop an incense, and be lazy. What do you get when you piece 848 small granny square together? The cutest Bulbasaur afghan ever! You have to see the afghan Craftster user, SoreLoser created. This is seriously inspiring. Inspired to start your own Pokemon afghan? Here’s an amazing 8-bit Pikachu blanket also created with the granny square method by Deviant Art user PiNiKoLi.